Prefers acidic soil or pots filled with ericaceous compost. 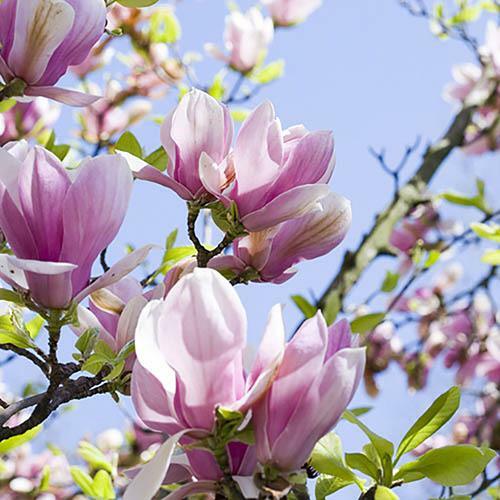 One of the most popular magnolias you can grow thanks to a succession of huge, tulip-shaped pinky white flowers that smother the branches of this shrub in mid to late spring. They are shown off to great perfection on the spreading bush as they appear before its dark green leaves. Eventually reaching 6m (20ft) by 6m (20ft) wide, it can be pruned to keep within an allotted area. It prefers acidic soil or pots filled with ericaceous compost. Supplied established in a 3L pot ready to plant out.